A judge ordered Fairfax County Police to release internal affairs records of the officer who shot and killed John Geer in August 2013. 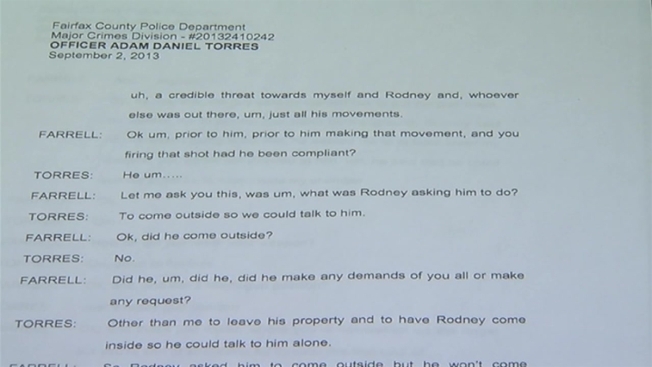 The records include current and past actions taken against Officer Adam Torres. Early last month, county officials named Torres as the officer who fired the fatal shot during a police standoff. Today's ruling enables Geer family attorneys to find out what, if any, action the police department took against Torres following the shooting. Additionally, documents will reveal the names of supervising officers who were on the scene at the time Torres shot Geer. Five months before the Geer shooting, previously released investigative documents said Torres lost his temper at a courthouse, angered by a prosecutor's decision to drop charges in a DUI arrest he'd made. The judge stipulated that if the Department of Justice, which is conducting its own investigation, asks the court to seal those files from the public, the judge would hear the motion within the next two weeks. The case is in the hands of U.S. Department of Justice Civil Rights division. The Fairfax County Commonwealth's Attorney Raymond F. Morrogh would normally handle such a review and decide whether criminal charges are merited. But in late 2013, Fairfax County Police refused to turn over some information Morrogh was seeking. He then referred the case to federal authorities, where the case remains more than a year later. Even though 17 months have passed, there's been no determination about whether the shooting was justified or whether Torres should be charged. The ruling is a big win for the Geer family, who have filed a $12 million wrongful death lawsuit against Fairfax County Police Chief Ed Roessler and the three police officers involved. In December, a judge ordered the county to release documents to Geer family attorneys. Last week, the county released more than 11,000 pages of documents that are part of the investigation into Geer's Aug. 29, 2013 death. Many of the police interviews released last week confirm what Geer's father and other witnesses to the shooting have always believed. Don Geer has always maintained his son's hands were held up as he stood inside the screen door of his Springfield-area townhouse during the standoff and that he was unarmed. Torres told investigators he fired when he saw Geer's hands go toward his waist and thought he might be reaching for a weapon. But documents show four other officers saw it much differently. Officer Rodney Barnes told investigators, "When the shot happened, his hands were up. I’m not here to throw [Torres] under the bus or anything like that, but I didn’t see what he saw." Geer family attorney Michael Lieberman said earlier that the discrepancy between what Torres and other officers told investigators indicates "that John Geer was shot wrongfully, unjustifiably." The judge's order Friday gives the Fairfax County Police Department until Feb. 20 to turn over the documents.